HarperCollins, 2011. 304 pgs. Biography. This was a fascinating autobiography! At the beginning of the book, the author has recently graduated from college and has plans to attend culinary school with the hope to become a chef. She spends her days working at a Boston bistro doing prep work and her nights reading cookbooks. However, her plans suddenly change when she is hit by a car while jogging. The accident broke her pelvis, fractured her skull, and knocked out her sense of smell. Her bones will heal, but she wonders if she will ever be able to smell and taste the same again. 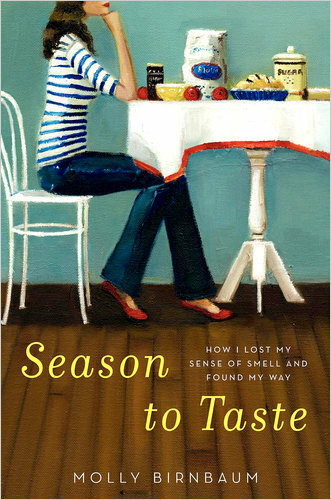 What follows is the journey Molly takes to learn about how the nose works, whether it’s even possible to regain her sense of smell, and how to once again feel confident in the kitchen. She talks to multiple doctors and clinics, interviews Oliver Sacks, visits a New Jersey flavor lab, and enrolls in perfume school in France. I thought that this book was so interesting. It read like a novel and I would recommend it to anyone looking for an educational, yet readable nonfiction book.